A very cool story is coming out of Memphis, Tennessee. The kids at the Le Bonheur Children’s Hospital have been seeing something different flying by their windows lately, their favorite superheroes. 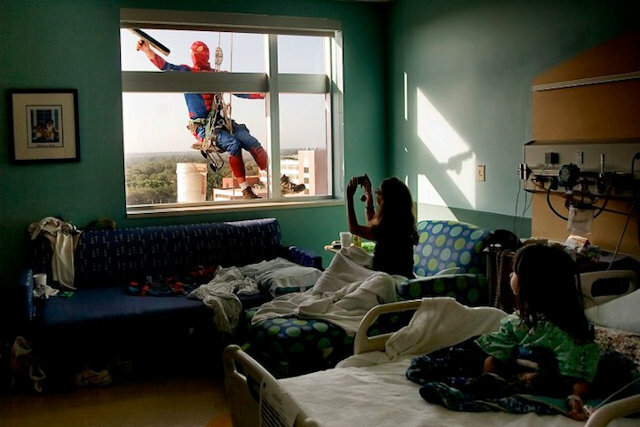 The Window Washers have taken to dressing up as superheroes for the kids while they work at the hospital. Following their rounds, the workers would turn in for a meet and greet much to the kid’s delight. “We just went there, put them [the costumes] on and went up. They [hospital staff] brought a lot of the kids to the little family room there so they could see us. It was unbelievable. They just totally forgot they were sick for a minute. They were just ecstatic about it. Thankfully, this is not the first time that we’ve heard a story similar to this one. Earlier this month, three men dressed as Spider-Man visited the All Children Hospital in St. Petersburg, Florida. A spokeswoman for the Le Bonheur Chidlern’s hospital said this kind of distraction therapy really helps kids heal because they are able to get their minds off of the pain. They can forget about their troubles and just enjoy themselves. This is a really heartwarming story and it is nice see that there are still some people with great hearts out there. You can check out a few more pictures below and there is also a video as well.